•06. Disaster: Vanquished Power, Victorious Enemy, Messenger. •36. Murder of Loved One: Slain Kinsman, Spectator, Executioner. •Draw out a tense moment, i.e., "waiting for the other shoe to drop"
•The Spunky Kid - Spirited and loyal, reliable and supportive, more of a "tomboy"
•The Free Spirit - Genuine and fun-loving, impulsive, an "original"
After the final draft, edit using the "find" function for the words on the following list. Next, read the sentence containing the offender, and either correct it or leave it be, depending. They are all valid words, if used in moderation, but are prone to misuse, overuse and abuse. "Fine Tooth Comb and Red Flags and Snags"
If the thought of an editor/agent appointment at the conference has you chowing down Tums, relax! It doesn't have to be an ordeal. When pitching an idea, keep it simple and keep it focused on the romance--don't bog yourself down with unnecessary back story, secondary characters, or subplots. All the editor wants to know is if you have a good grasp of your main characters, a balance of internal/external conflict, and the story's marketing angle ("hook.") Five to ten minutes is plenty of time, so speak slowly and carefully, maintain eye contact, and allow time for questions. "After years of working her way upward in the male-dominated maritime world of Great Lakes shipping, Tessa Jardine lands her dream job as First Mate on the passenger ship SS TALIESEN--a dream job until she meets her captain, Lucas Hall. Ten years ago, Lucas broke her young heart when he walked away from her without a word of farewell, and she can't forgive him for that--or for his more recent part in a failed rescue attempt that cost her younger brother his life. Now Lucas, the ex-Coast Guard hero, is back to complicate her life. Working together day after day, Lucas and Tessa discover the attraction between them is still hot and heavy--but can Tessa forgive Lucas, or ever learn to trust him again? And what will Lucas have to do to win back her love?" This brief paragraph introduces the main characters, given enough back story to provide motivation, shows the basic balance of external and internal conflict, focuses on the romance, and tells the editor it's a reunion story. Hope this helps, and good luck pitching your book! lands her dream job as First Mate on the passenger ship SS TALIESEN--a dream job until she meets her captain, Lucas Hall. Ten years ago, Lucas broke her young heart when he walked away from her without a word of farewell, and she can't forgive him for that--or for his more recent part in a failed rescue attempt that cost her younger brother his life. is back to complicate her life. Working together day after day, Lucas and Tessa discover the attraction between them is still hot and heavy--but can Tessa forgive Lucas, or ever learn to trust him again? And what will Lucas have to do to win back her love? Michele Albert writes for Pocket. Her most recent books are HER LAST CHANCE, TOUGH ENOUGH, HIDE IN PLAIN SIGHT, ONE WAY OUT, OFF LIMITS, and GETTING HER MAN. She also wrote four books as Michelle Jerott: HER BODYGUARD, A GREAT CATCH, ALL NIGHT LONG, and ABSOLUTE TROUBLE, which won the 1997 RWA Golden Heart Award for best single title contemporary romance. Michele is currently working on her next book. Please visit www.inkalicious.com for more information. Every Friday Morning my youngest, Megyn, goes swimming with her school. Since her treatment makes her tired and her legs hurt, I get to drive her to the swimming pool, then back to school. The class has only been attending swimming lessons for a handful of weeks and I'm happy to say Meg has come a long way. At the beginning, she wasn't very confident. And most certainly didn't like putting her face under the water. If you've watched you little ones learning to swim you may have notice the couch spends a little while throwing weighted rings into the water then encourage the children to dive underwater to collect the rings from the pool floor. It was while I was watching this part of the lesson a couple of weeks ago that I noticed something so sweet and heart-warming it melted me. One of Meggie's classmates, a cute little boy, noticed she was hesitating to duck beneath the water's surface. I could see him gazing at her while she surreptitiously maneuvered so she could pick up the ring with her toes. The part that really touched me was: the instant the couch turned her back the little boy dove down, collected a couple of rings and handed one to Meg! Isn't that just the sweetest thing? Great future hero potential, wouldn't you say? I don't know whether you agree, but that made me think all isn't lost with this world of ours just yet! So what about you? Have you encountered any little heroes in the making lately? Using the senses can add emotional depth to romance writing. Most writers include sight in description. Unfortunately, they often forget the other senses can greatly enhanced story depth, emotion and tone. 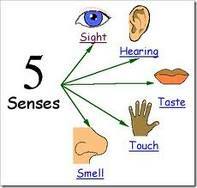 I know many writers speak of several more senses, but I’m focusing on the five senses here. By using all of the senses—hear, see, smell, taste, and, touch—throughout the story, we draw the reader in so she experiences the characters’ emotions which connects her to the story you are telling. Without emotion, stories are unexciting, lifeless and leave the reader cold. This will surely result in rejection since your first real reader will probably be the editor for the publisher you wish to contract your story. Say it with me: emotion is the spark that lights the firewood of your story and draws the reader in. And strong emotions/feelings capture the reader’s attention and keeps her hooked because it adds reality to your story. Emotion is by no means all you need to keep your reader hooked, but this is what we’re speaking about at the moment, so I’ll stay on topic. If you can weave good human emotions into your fiction, you will form connections with the reader and she'll invest her heart in your story. We all experience emotion, even the hard, ruthless alpha hero who has been hurt so badly he thinks he’s buried his emotions so deep he no longer has any. I don't mind telling you I'm an extremely emotional person. In fact, I’ll freely admit I live on my emotions. I laugh at things most people find not very funny (if someone fall over, I might very well wet myself! There’s just something about taking a spill that tickles me hugely) and I cry at things as simply as the beauty of nature. Emotions affect all of us in many ways, both psychologically and physiologically. We couldn’t function without emotions, so why do we think our characters can? They must have moods as we do—personalities and temperaments. They must have feelings about the things they see, hear, touch, taste and smell. I’m not suggesting you overload each paragraph with all five senses, merely to use them throughout the story to add depth. Each of the five senses, when used within relevant scenes will allow the writer to show the reader the story as oppose to telling her what’s happening. Just remember to arouse all of your character’s senses and you’ll do the same with your reader. It will result in a story that is significant and satisfying. Your reader will be fully invested in your story because she was able to connect with your hero and heroine, feel as if she was right there experiencing their experiences and she'll want them to have that happy-ever-after. So the next time you sit to write a scene, try to use as many of the senses as you can to describe your scene and add emotional depth.